At first the new playground Dr Fell builds in the neighborhood seems innocuous enough. As more and more kids come to play, however, Jerry, Nancy, and Gail realize that it is anything but, and it’s up to the 3 of them to figure out what is going on, and to stop whatever it is that their new neighbor is up to. Ahh, such a nice man is Dr. Fell. Q: What was your favorite genre or author as a kid? Did you have a favorite book? As a kid, I devoured Sci-fi and Fantasy. I loved David Eddings’ Belgariad series, Ender’s Game by Orson Scott Card, Raymond Feist’s Riftwar Saga, Issac Azimov’s Foundation books, the original Dragonlance series. I read a lot, but was always most drawn to flights of imagination rather than stories centered on our own world. Q: What are your favorites now – have they changed? I now also read a smattering of adult thrillers from time to time. Those, however, generally tend to have some element of the fantastic about them as well. Also, when I was a kid, the concept of Young Adult or Middle Grade books didn’t really exist, so that’s a big difference. There’s so much more out there to read that’s geared for kids of different ages. I read a lot of MG and YA even though I’m a lot older than the demographic because they are still some of the most interesting and fantastical stories. Q: Have you always wanted to be a writer, or did you want to be something else growing up? Growing up, I was going to be an actor. I knew from the age of about 9 that I was meant for the stage and screen. All through high school I only cared about doing theater. I went to college and got a degree in theater. I love being on the stage and performing. But I was always writing without knowing it. I was the guy who would write the shows we all did while growing up, and after college, I had more time to write and it really took on a life of its own. I don’t know if I can pinpoint the moment I went from thinking of myself as an actor to thinking of myself as a writer. Q: What do you enjoy doing when you aren’t writing? I’m a big fan of baseball. I was never very good, but I always loved the game. So I watch a lot, coach my son’s teams, obsess over statistics and standings. A day spent at a ballpark is a good day. A single black-and-white illustration. It had hung in my in-law’s home for years before I finally really looked at it. It was done by the late Trina Schart Hyman when asked to create a picture from any fairy tale or fable she wanted. It was labeled “Dr. Fell” and shows a tall man in a suit and top hat smiling down at a wary little girl. Behind him, the audience can see that he’s got a huge basket strapped to his back out of which are sticking arms, legs, and heads of little children. I loved the picture and had to know more. Q: Is Dr. Fell based on a real person? My Dr. Fell is based on the one in that drawing. Ms. Hyman took inspiration from a four-line poem written in 1680. “I do not like thee Dr. Fell / The reason why I cannot tell / But this I know and know it well / I do not like thee Dr. Fell.” My book is an exploration into why we don’t like this man, what is it about him that seems off, what is he really up to? I have two cats, Piper and Violet. Piper is a black-and-white ‘cow’ cat who loves to sleep on me when I’m trying to write. Violet is a calico cat who is friendly but prefers the company of my daughter. 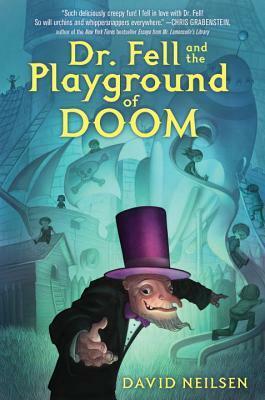 We hope you’re enjoying the blog tour for David Neilsen’s Dr. Fell and the Playground of Doom! In case you missed yesterday’s post, head over to Batch of Books to check it out. The tour continues tomorrow on Books4YourKids. NOTE: I received a free copy in exchange for my honest review. All comments and opinions are my own. < Previous I’m guest posting – come check it out! Interesting book and interview. Can see the daughters being intrigued. And are not most of us kids at heart?